Just wondering... why do cats purr? Good question! People think we purr because we're happy. That's true, of course. But there are other reasons why cats purr, too. And our purrs don't all sound the same. You have to really listen to understand what your cat's purr is telling you. Kittens purr to their mothers to let Mom know where they are. It's a way mother cats and kittens bond, too. And mother cats purr their kittens to sleep. Some cats purr when they want food. They purr and mew at the same time. I've never been able to figure out how to do that, but I can see where it would get our human's attention and make her open the cans even faster because it's so annoying. We purr when we're not feeling well or are in pain. Purring sounds as soothing to us as it does to you! I just learned this... According to an article on Wired.com (Wired writes about cats??) we purr at a frequency of about 26 Hertz. That's a range that promotes tissue regeneration. 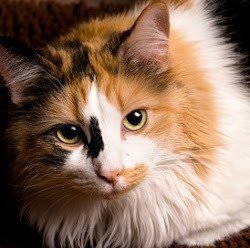 Purring can heal wounds and bones, reduce swelling and pain, and can repair tendons and build muscle. So that slogan, "Purr More; Hiss Less" is actually good advice, because our lifestyle demands strong muscles. You've probably heard that cuddling with a purring cat can relieve stress and lower blood pressure. But the vibration frequency of purrs can also speed up healing, reduce swelling and provide relief from pain in humans, too..
Of course, you'll have to spend a good bit of time with your cat to reap those benefits. But as another slogan goes, "time spent with a cat is never wasted," especially when you're not feeling well. Feeling stressed? This video of a kitten purring might be just what you need. Labels: Cat-Human Bond, Cats and Human Health, Why Do Cats Purr?